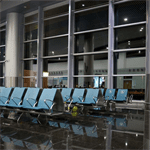 When German construction company Hochtief won the bid to expand King Khalid International Airport (KKIA), Zoeftig was commissioned as part of the construction to provide modern and comfortable airport seating solutions in a style that would stand the test of time. Adding to the airport’s four existing terminals, the new terminal (T5) is connected via three linking buildings, making the land area allocation one of the largest in the world. The construction reflects the growth in both domestic and international flight bookings in Saudi Arabia, increasing by 14% in 2017. The new domestic-only terminal was built to accommodate an expected capacity of 12 million passengers. With such a high demand for footfall, the brief required durable and reliable airport seating solutions that could withstand daily use, with playful shades to match. The expansion, which spans over 106,000 square metres, was furnished with 6,056 Zenky PlusPU seats as well as 792 full tables. 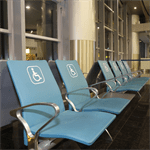 As part of the design to create an accessible terminal, the seating solutions also included 304 backs featuring the ADA logo. Fitting with the contemporary design of the airport’s interior, Zoeftig was commissioned to install airport seating solutions in various vibrant shades of red and blue. With digitalisation now implemented in most airports to streamline the high proportion of travellers passing through, the technological advancements of seating solutions play a central role in helping airports to enhance the passenger journey. The ability to charge mobile devices whilst in transit is paramount to making an airport as comfortable and accommodating as possible for passengers. To ensure individuals remain well connected whilst in T5, it was decided that 1,514 bespoke BUSP power sockets would be installed alongside the seating solutions.